All things eye | Por Yong Ming: EpiLASIK, ICL or LASIK? In recent years, LASIK has become one of the commonest operations performed. Its popularity and success are understandable, given the good outcomes experienced by the majority of patients. Still, there are potential side effects with any procedure, and LASIK also has its limitations especially for those with very high spectacle degrees. 2 commonly mentioned alternatives are epiLASIK and ICL (implantable collamer lens), and in Singapore these 2 procedures have been marketed quite heavily as well. Some of their proponents would have you consider undergoing these ops rather than LASIK, and in their reading material sometimes emphasise the potential side effects of LASIK. So, what's the deal with these alternatives and are they really to be preferred over LASIK? There are pros and cons with each procedure. With epiLASIK, the advantage (which is also a disadvantage, as you will see later) is that no corneal flap is created, so theoretically the eye is stronger and perhaps at somewhat lower risk for a complication called corneal ectasia. Having said that, the vast majority of cases that we do are LASIK rather than epiLASIK. Visual recovery following LASIK is much faster than after epiLASIK. In comparison, vision the second day after LASIK is already pretty good (usually in the region of 6/6 and 6/7.5), but for epiLASIK, to reach a comparable level of vision you might need to wait several weeks. We also take precautions not to go below 250 microns of residual stromal thickness and this avoids ectasia in normal LASIK patients (the risk being in the region of 1 in 5000 cases or so). The problem with epiLASIK/LASEK/PRK procedures is that the corneal epithelium is removed (see below). Healing of this to provide a smooth surface will take from several weeks up to a couple of months or so. Because the surface is ablated, there is a chance of corneal scarring, but this is much less nowadays since we use mitomycin C at the end of epiLASIK/LASEK/PRK. I have grouped epiLASIK/LASEK/PRK together since they are essentially the same procedure. The difference is in how the epithelium is removed. In epiLASIK, a special blunt blade (tissue separator/microkeratome) cleaves the epithelium from the stroma. There is a risk that the blade may cut into the corneal stroma sometimes, resulting in an uneven surface, and because of this risk we don't do epiLASIK in our clinic. LASEK uses alcohol to loosen the epithelium, and this is our method of choice if we decide on surface treatment for a particular patient. The LASEK we do is 'epithelium-off', or 'alcohol assisted PRK' (see below in italics). Traditional PRK used a toothbrush type scrubber and we think the alcohol is gentler to the eye. In our clinic we currently reserve LASEK for patients with corneas that are too thin for conventional LASIK. The number of patients who have this done is probably less than 5%. The others all have LASIK with a 'bladeless' technique ie. 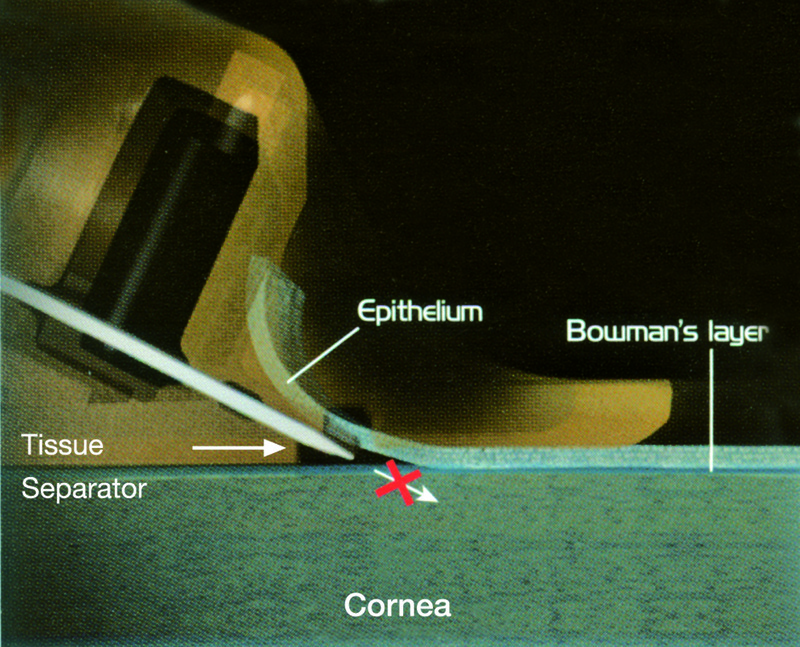 using a femtosecond laser to create the flap and then the excimer laser to reshape the cornea. The ICL (above) is similarly different, with different pros and cons. When LASIK is done for patients with very high spectacle degrees or thin corneas, the area of cornea treated (optical zone) is smaller, so that the cornea does not get too thin. Unfortunately, when the area treated is small, the risk of halos in the dark and poorer quality vision also rises. The good thing about the ICL is that halos, even if present, are usually very mild even when the spectacle power corrected is high. 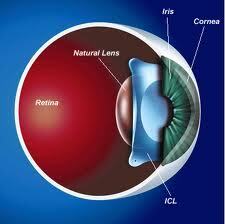 It is also true that after ICL, the eye does not get as dry as after LASIK. However, potential intraocular (inside the eye) complications exist with the ICL, of which cataracts and glaucoma are the 2 main (but rare) ones. The main thing about reducing complications with the ICL is to achieve accurate sizing, and at our clinic we do 'sulcus to sulcus' measurements for all ICL patients. What is the sulcus? This is the little nook in the eye just behind the iris (coloured part of the eye) and in front of the original crystalline lens where the ICL will sit. If the ICL is too big for this space in a particular eye, it will be 'squashed', bend forwards, and narrow the drainage angle of the eye (increasing the risk of glaucoma). If the ICL is too small for this space, it will sink backwards and touch the crystalline lens, thus causing a cataract. Although there is no perfect way to measure this sulcus diameter down to the last micron, we have found the Artemis VHF ultrasound biomicroscope (above) to be very accurate and allows us to choose an appropriate size ICL. The figure below shows a measurement made by the Artemis. I would say that for my patients with lower spectacle powers, LASIK provides excellent clarity of vision including night vision (and without the risk of any intraocular complications). I have performed ICL surgery for a number of patients with excellent results, but I think bearing in mind the potential seriousness of problems with the ICL my preference is still an extraocular (outside the eye) procedure like LASIK in cases where I judge that the outcome will be good. Extraocular means zero chance of causing cataract or glaucoma. Actually, I think the ICL is wonderful, but I prefer to use it for patients with very high powers or thin corneas, where I feel that the risks of intraocular problems are outweighed by the better visual quality that can be obtained with the ICL in such cases compared with LASIK. 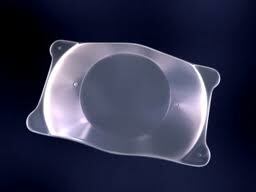 Although a lens is implanted into the eye in both ICL as well as cataract surgery, an ICL op is quite different from a cataract op, not least because when an ICL is implanted the patient's original crystalline lens/cataract is left alone while during a cataract op the crystalline lens/cataract is removed and is replaced by an intraocular lens implant (IOL). This has implications because there are some doctors out there who perform 'clear lens extractions' to correct high spectacle degrees. If a 'clear lens extraction' (which is like a cataract operation) is done in a younger person less than 45 years old or so, then they will immediately lose the ability to focus for near ie develop immediately the maximum amount of presbyopia/LaoHua. ICL surgery will not affect the development of presbyopia, nor can it cure this problem. ICL surgeons can offer monovision with the ICL, just like with LASIK or contact lenses. On the other hand, if somebody has a cataract then he/she should have a cataract op, not an ICL op. The ICL surgery doesn't do anything about a cataract, which would continue to blur the vision. Overall I would say, go for LASIK if your cornea is thick enough because the theoretical advantages of epiLASIK probably do not bear out clinically for the majority of patients. ICL surgery is a great option for those who would otherwise be at risk for visual or other side effects from LASIK. I came across this post and got a lot of information about LASIK. Your post is really helpful. Thanks for sharing this with us. I know about an eye clinic which provides best cataract removal surgery. Interesting information on Lasik! I didn't know it made a difference if you had cataracts or not. That makes sense I guess though. My mother has been considering Lasik for a while now. She might have cataracts though. I will have her read this article. I think I will go for lasik. It's easy, affordable, not so much harmful for your eyes and had several good reviews about it. Though I have to check in with my doctors from http://www.boisemountaineyecare.com/ and then I will be able to decide. You need to fix your appointment your appointment with the Rana Hospital if anyone from you wants to get the perfect solution for eye problems with lasik eye surgery in India at low costs.